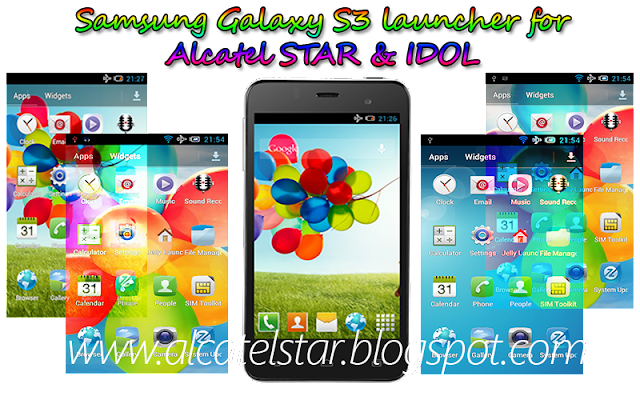 Brilliant Launcher from Samsung Galaxy S3 for Alcatel STAR & IDOL and will work on other Android GB, ICS or JB devices actually launcher is for Samsung Galaxy Y.
Launcher is really beautiful style working smoothly with super visual effects like on Samsung Galaxy S3 device also icons is original stock from Galaxy S3. Another thing launcher have integrated stock colorful wallapers pack from Samsung Galaxy S3 as you seen on screen shots. DISCLAIMER: We(alcatelstar.blogspot.com) or developer of this APP are not responsible for any damage on your phone after installing this APP.DO IT AT YOUR OWN RISK!!! You need to download flashable zip Galaxy S3 launcher from - here and copy to sdcard. Then enter into CWM or TWRP(I using TWRP because CWM not fully functional for yet). That's it Reboot phone and Enjoy for this great launcher!!! Warning: If you do not like this launcher you can easily remove by installing flashable uninstaller via CWM or TWRP recovery. As I wrote in the post actually launcher is for lower resolutions Androids but this quality of images enough for me.